You’re growing, you’re hiring, your making decisions on new team members. If you’re like me it is one of the least favorite things you will have to do as an entrepreneur. You post an ad, have some interviews and hire someone that you basically have known for one hour. Then reality sets in. You basically only know a little bit about your new hire. They may or may not be a great tech, or worse he may be a terrible fit for your culture and act like a cancer on your team. Today we’re going to talk about some great ways to improve your hiring process and get the right people in the right seats at your company. In episode 9 of the IT provider network I am going to share with you the tools and processes I use to search for great candidates and in episode 10 we’ll talk about interviewing and testing and finally in episode 11 we will talk about some great employee onboarding tips to get your new hire settled in and feeling like part of the team. 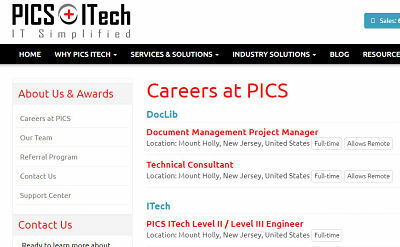 Before I get to the content of the show I wanted to give a special shoutout to my team at PICS ITech. We made the MSPMentor MSP 501 list for the 5th consecutive year in a row and that wouldn’t have been possible without the team. Finding a good hire starts with a good job description that you can tailor into a great job advertisement. I would recommend that if you are hiring for an existing position that you analyze your existing job and see what the role, requirements, and qualifications are for that position. Then we can roll that into a formal job description that your existing and new employees can use as a guideline for their job. If you are starting from scratch and in the US, look at the US Department of Labor Career One Stop website. They have an online job description creator that will give you a good editable start on your job description. You put in a job title and a location and the tool will spit back a job description that you can edit online and save. I use a supercharged version of a job description in our company. We use Employee Strategic Plans or ESP’s to work with each of our employees so that all parties involved know what is expected of them and also that individual team members plans flow up to department plans, divisional plans and finally to our corporate plans. The ESP’s include goals, responsibilities, and qualifications like a normal job description but add time allocation, career paths and expectations to the document. Once you have a good job description it’s time to create a great job advertisement. One of the sayings we have around the office is “someone’s always selling someone” and this is your first chance to sell your company and your position to the candidate. There are many articles on the AIDA method, so google it and you can do a deep dive but I will break it down quickly for you here. A – Attention – you can’t get a good candidate if you cannot get them to click on your advertisement so you need to capture the candidate’s attention in the beginning of your ad. This starts with the Job Title or the Posting Title. Make sure it is written in such a way that you will get the most candidates to click on the ad and start to read. I – Interest – This is where you need to start building interest in the position. I like to write as if I am speaking to ONE candidate and telling them about the position. For example statements like “You will be helping our customer do x y and z”, “You will work with your team to make change by doing a, b and c”. Put the candidate in your company when you write. Make them feel like they are already working with you. D – Desire – This is where you need to move from the candidate’s mind to their hearts. You want to build real desire to work with your company and for them to be in this role. You need to appeal to their personal wants and desires. Start painting a picture for them. “At our company, you will enjoy 3 weeks paid time off, have a company car and the freedom of a flexible schedule” or “Working with our company you will have the top of the line equipment, have a new cell phone of your choice and the ability to work from home”. A – Action – This is the call to action where you need to close. Like any good advertisement, you only want one call to action. In a job advertisement, you want the candidate to apply. Make it easy for them but also make it efficient for you. I’ll give you some pointers on making this process as smooth as possible in a few minutes. Now you have your job description and your job advertisement, now you are ready to post your advertisement. You have a lot of choices on where to post and the cost to do so are very different. You will get a lot of opinions on the best job boards and I have tried most of them. I will give you my opinion but your mileage may vary. Before you post, you might want to think about using a candidate tracking system. So what is a candidate tracking system and why do you need it. What is a Candidate Tracking System? The candidate tracking system gives you some excellent tools to help you manage the volume of candidates you are going to have since you did such a great job on your job advertisement. A dedicated email address for advertisement – using a dedicated email address keeps your email clean and not exposed to the job sites. A dedicated web page for this advertisement – This is where you will be directing your candidates in the call to action of the ad. It will allow them to apply and attach their resume. Auto Responders for Candidates –using an auto responder is an excellent way to continue to sell your position to candidates that are now “warm leads”. I use this autoresponder to tell the candidate a little about what to expect; I give them an overview of our hiring process. I also invite them to follow us on the social media channels and to visit our website. Candidate Tracking – Most systems have stages that you can assign candidates. If we continue with the analogy of a lead, you can move the lead either forward in your process or archive them if they are not a fit. Each move of the candidate can have an automatic email to the candidate and the internal person responsible for that step. Resource Assignment – As candidates move through the process you can assign reviewers to look at the resume or assign actions that the candidate needs to complete to continue moving forward. I use a tool called Recruiter Box and have found it a big help in our recruiting process. You can find a link to the site and a free trial in the show notes. It starts at about $65 dollars a month if you pay annually or $90 if you want to pay monthly. I briefly mentioned the many choices you have for job boards. There is also a big difference in the pricing for these services. If I were you, unless you are in a really rural area, I would stay away from newspaper ads, I don’t think to many job seekers are cruising the Sunday paper for jobs these days. Craigslist – This one is controversial but I have had decent results for local technical people. Techies like craigslist and they monitor it. If you are not familiar with Craigslist, it is a classified ads website, which is now operating in over 70 countries. The site has over 80 million new advertisements each month but it is geographically segregated. If you live in the Philadelphia area you are going to be searching the Philadelphia Craigslist. Craigslist is a great place to post a job for little or no cost. In some areas, it is free, but in most areas, it comes with a $25 to $75 fee. Peanuts for a job ad. Indeed – Over 200 million people visit Indeed every month, giving you access to a ton of job seeker. This is, of course, a blessing and a curse, but it does put your job advertisement in front of a large audience. Job postings are free and will allow you to be found in search results, receive applications, and manage your candidates. Free, it good, but your job is going to end up in a pretty big pool with every other free job posting on Indeed. You can also sponsor your job ad for a minimum of $5 a day, this puts your posting on the top of the search result above the free listings. Think of it as a Google AdWords ad with the organic search results below it. I always post a free add on Indeed.com and most of the time I use a sponsored ad as well. LinkedIn – LinkedIn does what a real recruiter agency is supposed to do. Give you the ability to pull candidates from a pool of professionals that might not be actively looking for a job. It’s high quality and high priced. Jobs are presented to LinkedIn users on the right-hand side of the page in the “Jobs you may be interested in”. Once your job is posted, you’ll receive – fifty free profile matches and five free InMail messages that allow you to contact LinkedIn members that are not part of your network. When posting a job on LinkedIn, you can pay for your ad by setting a daily average budget. The actual amount you’re charged depends on your daily budget and the number of job posting views from candidates. It can be up to twice as much as your daily budget but it will not exceed your total budget. Listings expire after 30 days so make sure you set a reminder to re-post. ZipRecruiter – ZipRecruiter is a service that gets your job posting on over 100 job boards and social network sites. ZipRecruiter charges an annual fee so keep that in mind that you’ll want to have more than one opening if you go with ZipRecruiter. There are different packages to choose from and all of which have a free trial. The service starts at $250 per month for the Starter plan and includes three active job slots. The next level up is the Team package, at $350 a month and that comes with 10 active job slots. The top level plan is over $1200 a month so if you need that plan you better have some serious hiring to do. One thing about these job posting sites, if you are using a candidate tracking system like Recruiterbox then you can post single jobs on these boards after you create a new opening.This is a much more affordable way to get the job out there. To give you an idea, to do a 30-day ZipRecuiter traffic boost, the fee is $90.00. There are many more job posting sites out there like Glassdoor, CareerBuilder, and Monster. I have used these in the past but have been flooded with unqualified applicants. Your mileage may vary but I am not a big fan. Don’t Forget to Get Social! After you get your job posted, don’t forget to get social and spread the word, your network is a great way to find new candidates. Publish on your personal social accounts, your company pages and ask your staff to spread the word. If you are able to offer a referral bonus that would be the time to let your team know about it. We offer $300 for anyone in our company that brings in our next hire and over time this number has gone as high as $1500 depending on the severity of the talent shortage. In Episode 5 of the IT Provider Network Podcast we talk about Tools for Publishing, have a listen to episode 5 for some time-saving tools. So that’s it for Episode 9 of the IT Provider Network. In the next episode, I go over my process for testing and interviewing and share some of the techniques I use for slimming down the candidate funnel so I am not wasting my time. As always, thank you for spending some time with me today. If you think I am adding value please think about rating and subscribing to the podcast. I would truly appreciate it. If you want to reach out to me you can do that by using the contact form at the itprovidernetwork.com. Thanks again and have a great one! If you investigate or purchase any product or service that I have talked about, please remember to mention that I sent you. I may or may not get a small commission but more importantly I hope to spread the word about the IT Provider Network. Please consider Subscribing to the Podcast it is the only measure of listenership I have. Your written iTunes reviews encourage me and they help other people find the podcast. If you appreciate the information you are learning from the IT Provider Network then please do me a HUGE FAVOR and write a review on iTunes or on Stitcher! I put these down here in case you are looking for anything from Amazon, I get a small commission if you click-thru from this site. You don't have to buy these items just click through from this page. Thanks in advance! What do Jordi Roca, Chris Brogan and Michael Porter have to do with your MSP?